I recently read a New York Times magazine article called “Building a Better Teacher” by Elizabeth Green. It was informative in its way, but the piece as a whole really left a lot to be desired. It was technicist and very narrow in its approach to thinking about what teaching is, who students are, and how one learns teaching as a craft. That Green is a Spencer Fellow in education made this fact all the more depressing. The article provides a very good look at the current concerns over inadequate supplies of highly-qualified, effective teachers. Green examines various efforts to understand and document the work of such teachers, and to explain these efforts to NYT readers. She documents the work of people such as Doug Lemov, a former teacher, principal and charter-school founder who has developed a personal mission: to develop a deep knowledge of excellent teaching and to pass that knowledge along to those in the teaching profession. Lemov’s Taxonomy is what came out of this mission, and a book about it will come out soon called Teach Like a Champion: The 49 Techniques That Put Students on the Path to College. Green also documents the work emerging out of places like Michigan State University and other places who have focused hard on high quality research and teaching about the work of teaching. The work to better understand the work of excellent teachers is noble. For those who care about issues of equity and democracy – as many readers of this blog do – there is little more paramount than the work of teaching teachers. No other variable matters more in helping kids from poor and racially-isolated neighborhoods to experience academic success. And there is an awful lot we do not know or understand about how to develop, coach and assess excellent teaching. Three points strike me about this excerpt. One, this description leaves out the role of the liberal arts curriculum. At my institution and others, the liberal arts is seen as playing an important role in teaching critical thinking, communication, and inquiry, all essential skills for great teaching. The second problem with Green’s account here is that it over-states the foundations element and the role it plays today. At my university (a public, selective state institution enrolling around 14,000 undergraduates), out of an approximately 128 credit hour teacher education degree, the foundations requirement takes up exactly three of those credit hours, constituting about 2% of the total learning (if credits could be equated to learning, which they can’t). And the third problem with this excerpt is that it’s confused. If 88 percent of education faculty school professors have taught in schools, isn’t the accusation that they are “out of touch” with real schools a bit hard to claim? Green is right that schools of education have long suffered status problems, and have responded in various ways that were not always in the bests interest of schools or children. One wonders, however, what might be the problem with using social science to better understand how schools work or function as social systems. One also wonders where Green learned about progressivism. Not even progressivism’s worst enemies would sum it up in the dismissive way that she does here. Technique is important, but it is always the means to an end. What “end” does any teaching technique serve, and is that end a laudable goal? If teachers cannot answer this larger question, then they are merely following a manual. Teachers must know how to teach – I know of no one in my school of education who argues otherwise – but one should not confuse the techniques of teaching with the craft of teaching. Craft is part art, part science; it is a moral endeavor that cannot be simplistically reduced to a list of techniques for people to follow after they’ve learned the content of math, history, or English literature. I doubt that Green, a Spencer fellow, understands teaching in this simplistic way. Unfortunately, her article leaves exactly that impression. The focus of our Winter 2008 issue of the Journal of Educational Controversy was on the topic, “Schooling as if Democracy Matters.” In that issue, we raised the question about the ways we should teach the young about the foundations of our democracy and our collective identity in an age of the patriot act, NSA surveillance, extraordinary rendition, preemptive wars, enemy combatants -- all likely to involve violations of civil rights and liberties and a curtain of government secrecy? We asked, what story do we tell our young about who we are, who we have been, and who we are becoming? I’d like to raise this same question in light of today’s events. In an interesting NY Times op-ed article, “The Rage Is Not About Health Care,” Frank Rich talks about some of the underlying reasons for the rise in rage, venomous rhetoric, violence, and anxieties in today’s demonstrations against the recently adopted health care bill. Comparing the bill’s passage to earlier bills that shook the country – the Medicare Act of 1965 and the Social Security Act of 1935, Rich describes the rhetoric and the upheavals that these bills also caused. But the bill that comes closest to the type of vitriolic criticism that today’s bill is evoking, Rich argues, is the Civil Rights Bill of 1964. This may sound like a strange claim given that the present Health Care bill actually contains many of the recommendations of the Republican Party, falling far short of the single payer system or public option plan that more liberal proponents advocated. Rather than a “government takeover,” it extends the free market’s involvement in health care. While there are legitimate arguments over health care entitlement, the type of reaction we are experiencing seems to be disproportionate. Rich argues that the health care bill is just a spark that is galvanizing anxieties at a deeper level. Rich notes that there were some responsible leaders of both parties who tried to put a lid on the resistance and violence that took place after the passage of the Civil Rights Act of 1964, unlike the silence coming from the lack of leadership among today’s political leaders, who often tend to exploit the anxieties instead. A few days ago, a friend of mine sent me a link to a educational web based "computer game" called Urgent: Evoke. The game is produced by the World Bank's educational arm, the World Bank Institute. I've always been interested in the pedagogical potential of computer games, so I decided to check it out. The first thing that struck me was that Urgent: Evoke is not actually a computer game, at least not in the conventional sense of the term. Computer games usually immerse the player in some sort of virtual world; Urgent: Evoke does not do this (or, at least, it certainly doesn't do it effectively). Instead, Urgent: Evoke draws students' attention to current social problems and offers them points for completing "missions" that are focused on analyzing and solving these problems. In short, Urgent: Evoke isn't a computer game at all. It's a web based curriculum with a reward scheme attached to it. This highlights another important question: if Urgent: Evoke is a web-based curriculum, what are its intended goals? Ostensibly, Urgent: Evoke is supposed to raise awareness of social problems and galvanize students to work toward solutions. However, a quick inspection of the "game" reveals that the purpose of the game is to extol the virtues of a variety of philanthrocapitalism called "social entrepreneurship." Philanthrocapitalism, to put it bluntly, is basically the idea that one can do good and promote capitalist solutions at the same time. The curriculum opens with a cartoon that introduces students to the Urgent: Evoke team. 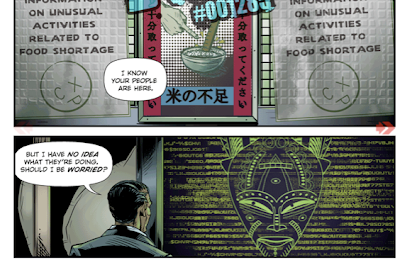 In the first episode of the cartoon, the team, a group of technocratic superheroes, is preparing to swoop in to solve a food shortage that is facing Tokyo (you can click on the cartoons for a closer look). 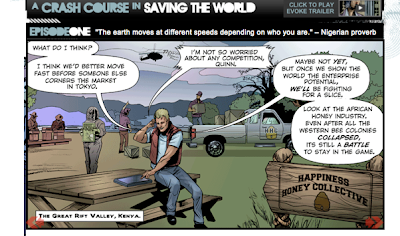 In this panel, one of the social change superheroes is talking on his cellphone. He comments, "I think we'd better move fast before someone else corners the market in Tokyo." He adds, "...once we show the world the enterprise potential, we'll be fighting for a slice." This food shortage is a social problem with moneymaking possibilities! As our World Bank hero gets ready to climb into his helicopter, he remarks, "Feed the people, clean the air, cool the climate...and make a few dollars in the process." The social entrepreneurship dream is thus nicely summed up. Tip #19: Think like a child. Children have no limit to their thinking. Tip #26: Keep learning from your customers. Once they have mastered these recondite secrets of social change, the students are assigned to choose a real-life "social innovation hero" to shadow. Shadowing, in this instance, means following the "hero" on Twitter or friending them on Facebook. The student could, for example, choose to shadow Nigel Waller, who heroically sells cellular phones to people who earn less than $2/day. The governor of Tokyo doesn't know what our heroes are up to, but that's no problem. That's just the way that social innovation works! 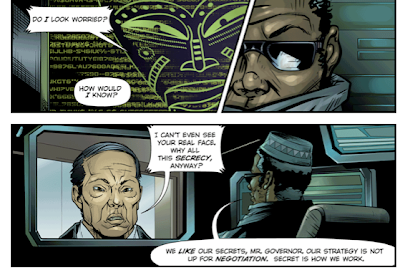 In the panel above, the leader of the Urgent: Evoke team responds to the governor's concerns, "We like our secrets, Mr. Governor. Our strategy is not up for negotiation. Secret is how we work." Obviously, it doesn't matter whether one wants social entrepreneurship--it's coming anyway! 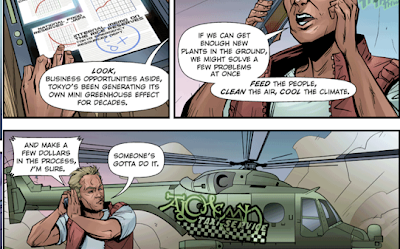 After the heroes have saved Tokyo, the student is prompted to learn more about food security. They can, for example, learn about how the One Acre Fund is helping farmers in Africa. This organization is strongly committed to philanthrocapitalism. The website proclaims, "We don’t hand out—we empower farmers with tools, and they pay us back." Remember secret #3 of how to create social change: don't give things away--embrace market mechanisms! The tools which are provided include encouraging farmers to grow more lucrative cash crops as well as providing them with hybrid seed (which cannot be reproduced) and fertilizer. The ideology behind this curriculum is crystal clear, and no one should be shocked that it is the World Bank that has created it. The head of the World Bank, Robert Zoellick, is a George W. Bush appointee and a former Goldman-Sachs investment banker. For the World Bank, capitalism isn't the problem--it's the solution. Mrs. Squeers was stationed at one end of the room, where she was feeding out brimstone and treacle to each boy in turn. "Medicates 'em," said Squeers. "Rot!" said Mrs. Squeers. "It takes away their appetites, and that's good for us. It purifies their blood, and I hope that's good for them." Philanthrocapitalism is supposed to provide a sunnier version of this kind of win-win, good-for-us/good-for-them situation. But does it really? In a review of Michael Edwards' new book, Small Change: Why Business Won't Save the World, authors Mark Engler and Arthur Phillips explain some of the shortcomings of this idea. Even in its more palatable forms (e.g. where the philanthrocapitalist is not trying to make money him/herself), philanthrocapitalism does little to question the system that, arguably, produced many of the social disparities that it is supposed to address. Notably, as educators, we can turn to our own tradition for criticism of philanthrocapitalism. In Pedagogy of the Oppressed, Freire wrote about false generosity. The falsely generous person, Freire claimed, tries to ameliorate the problems of the poor while simultaneously upholding the unjust social system. Philanthrocapitalism is simply the latest variation on this old theme. Update: there's a great parody of the game at Urgent: Invoke. Check it out!